Travel east on Thunderbird to 94th Drive. Turn right at 94th Drive. Travel South to the Dental Arts building. Turn right just after the Dental Arts building into the court and turn right again into the parking lot. 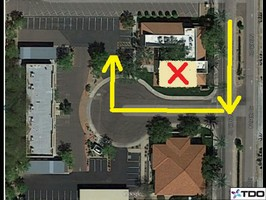 Dr. Schindler's office is on the right in Suite C.
Travel west on Thunderbird to 94th Drive. Turn left at 94th Drive.